This name uses Spanish naming customs: the first or paternal family name is Ulloa and the second or maternal family name is de la Torre-Giral. 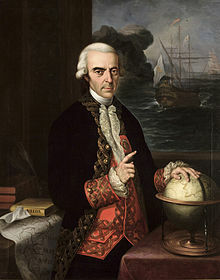 Antonio de Ulloa y de la Torre-Giral, FRS, FRSA, KOS (12 January 1716 – 3 July 1795) was a Spanish general of the navy, explorer, scientist, author, astronomer, colonial administrator and the first Spanish governor of Louisiana. He was appointed to that office after France ceded the territory to Spain in 1763, following its defeat by Great Britain in the Seven Years' War. Ulloa's rule was resisted by the French Creole colonists in New Orleans, who expelled him in 1768 from West Louisiana. Ulloa had already established an international reputation in science, having been part of the French Geodesic Mission in present-day Ecuador. He published an extensive record of his observations and findings on the South American trip, which was published in French in 1848 and in English as A Voyage to South America (1806). He was a Fellow of the Royal Society and a foreign member of the Royal Swedish Academy of Sciences. Ulloa was born in Seville, Spain. His father was an economist. Ulloa entered the navy in 1733. In 1735, he, along with fellow Spaniard Jorge Juan, was appointed to the French Geodesic Mission. The French Academy of Sciences was sending this scientific expedition to present-day Ecuador to measure a degree of meridian arc at the equator. Ulloa worked in Ecuador from 1736 to 1744, during which time the two Spaniards discovered the element platinum in the area. Ulloa was the first person to write a scientific description of the metal. Ulloa is sometimes incorrectly credited with discovering platinum, because of this. In 1745, having finished their scientific labours, Ulloa and Jorge Juan prepared to return to Spain, agreeing to travel on different ships in order to minimize the danger of losing their important samples and records. The ship upon which Ulloa was travelling was captured by the British, and he was taken to England as a prisoner. In that country, through his scientific attainments, Ulloa gained the friendship of the men of science, and was made a Fellow of the Royal Society of London. In a short time, through the influence of the president of this society, he was released and able to return to Spain. He published an account of the people and countries he had encountered during the French Geodesic Mission (1748), which was translated into English and published as A Voyage to South America (1806). Ulloa became prominent as a scientist and was appointed to serve on various important scientific commissions. He is credited with the establishment of the first museum of natural history, the first metallurgical laboratory in Spain, and the observatory of Cadiz. In 1751, de Ulloa was elected a foreign member of the Royal Swedish Academy of Sciences. In 1758 he returned to South America as governor of Huancavelica in Peru and the general manager of the quicksilver mines there. He held this position until 1764. After France was defeated by the English in the Seven Years' War, it ceded its territories west of the Mississippi River to Spain. Ulloa was appointed by the Spanish Crown to serve as the first Spanish governor of West Louisiana, and reached New Orleans, the major city and port, on 5 March 1766. The French colonists refused to recognize Spanish rule, and expelled Ulloa from Louisiana by a Creole uprising during the Louisiana Rebellion of 1768. On 28 October, as riots broke out in New Orleans, the governor and his pregnant wife were taken to a Spanish vessel. The Superior Council voted that the governor leave within three days. He complied, leaving on 1 November. The revolt was ultimately crushed by forces under Alejandro O'Reilly in 1769, establishing Spanish dominance in the colony once and for all. For the remainder of his life, Ulloa served as a naval officer. In 1779 he became lieutenant-general of the naval forces. Ulloa died at Isla de Leon, Cádiz, in 1795. In collaboration with Jorge Juan mentioned above, he also wrote Noticias secretas de América, giving valuable information regarding the early religious orders in Spanish America. This work was published by David Barry in London, 1826. ^ Larrie D. Ferreiro (20 August 2013). Measure of the Earth: The Enlightenment Expedition That Reshaped Our World. Basic Books. p. 265. ISBN 978-0-465-02345-5. ^ Yanes, Javier (12 January 2016). "Antonio de Ulloa: the Discoverer of Platinum?". Knowledge Window. OpenMind. Retrieved 1 November 2018. ^ Aristizábal-Fúquene, Andrea (2015). "El platino: contribuciones sociohistóricas y cientifícas desde el siglo xviii. Parte I" [Platinum: Scientific and Socio-historic Contributions from the 18th Century]. Educación Química (in Spanish). 26 (2): 146–151. doi:10.1016/j.eq.2015.04.009. ISSN 0187-893X. ^ Whitaker, Arthur P. (May 1935). "Antonio de Ulloa". Hispanic American Historical Review. 15 (2): 155–194. doi:10.2307/2506293. JSTOR 2506293. ^ Paul Murdin (25 December 2008). Full Meridian of Glory: Perilous Adventures in the Competition to Measure the Earth. Springer Science & Business Media. p. 67. ISBN 978-0-387-75534-2. ^ Fred Schaaf (1983). Wonders of the Sky: Observing Rainbows, Comets, Eclipses, the Stars, and Other Phenomena. Courier Corporation. p. 44. ISBN 978-0-486-24402-0. This article incorporates text from a publication now in the public domain: Ventura Fuentes (1913). "Antonio de Ulloa" . In Herbermann, Charles (ed.). Catholic Encyclopedia. New York: Robert Appleton. Wikimedia Commons has media related to Antonio de Ulloa. This page was last edited on 30 March 2019, at 10:04 (UTC).